Today we know that health goes beyond the physical aspect, our mind and spirit need to float away to renew our energies. 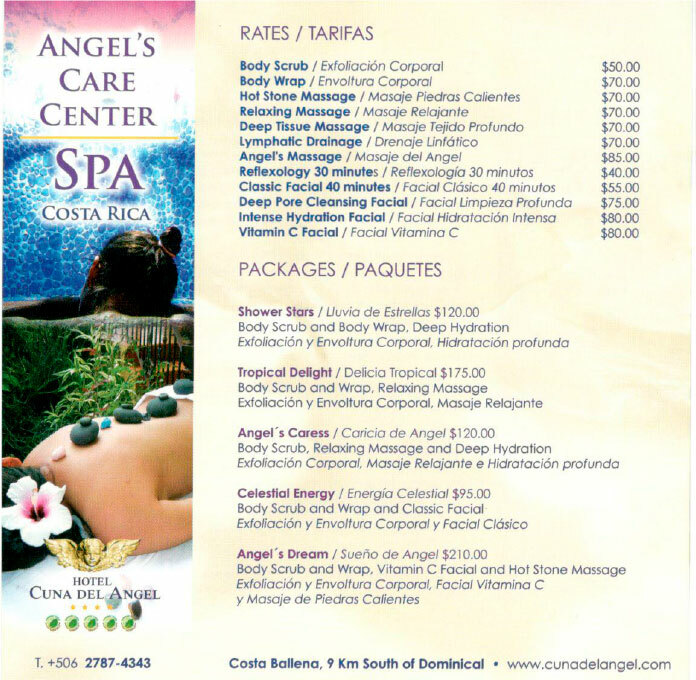 Angel´s Care Center is a wellness center in the middle of the tropical forest of the South Pacific of Costa Rica, where the resplendent green of the mountains and pristine beaches can be admired year around. The Spa at Cuna del Angel offers its guests a wide range of beauty and wellness treatments in the soothing ambiance of natural splendor. Our aim is to help achieving a balance between body, mind and spirit – an overall sensation of delight and wellbeing. We use some of the world’s finest cosmetic products, such as Germain de Capuccini, and state of the art technology, such as cellular stimulating and accelerating equipment for rejuvenation. Additionally our qualified team of professionals will ensure the best specialized and personalized care. All members of our friendly staff are your Guardian Angels, here at Cuna Del Angel. Our beauty salon offers a wide range of services to help you look and feel your best. Our staff has been trained in the newest European methods of hair styling and colour techniques. We offer manicure and pedicure, hair extensions, and deep conditioning treatments. A full range of services, including cutting, coloring, and styling for your pleasure and radiance.